This is even better made a day ahead so that the flavors have a chance to meld together–a great make-ahead dish! Heat a large sauce pan or dutch oven over medium heat and add sauté liquid or pan spray. Add onion, and cook 5 minutes, or until softened, stirring often. Stir in curry powder and cook 1 minute, stirring constantly. Add sweet potatoes, cauliflower, lentils, tomatoes with juice, and 1 1/2 C water. Bring mixture to a boil. 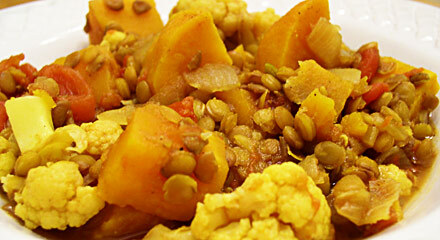 Reduce heat, cover and simmer 30 minutes or until lentils and sweet potatoes are tender. (Add additional water as needed.) Season to taste with salt and pepper (optional). Spoon mixture into bowls and serve hot. Perfect “back-up” recipe requiring minimal ingredients. I go to this recipe frequently, mostly because I’m absent-minded and tend to run out of staples, like vegetable broth, soy milk and nutritional yeast. I can add almost anything to this to enhance the flavor a bit: peanut butter, Sriracha, low fat coconut milk, Thai curry paste, soy sauce, ginger, garlic… and it cooks thick, like a stew, so I usually serve it over rice. And as a stand-alone it may not win any awards but it’s not bad. Not bad at all. I don’t know what type of curry powder the original recipe used, but I was not impressed with this recipe. It was hearty, but not especially tasty.